28 March 2018 Are watches getting smaller? 22 March 2018 Edition I : "Ode to Spring"
22 March 2018 "Hobo Coin"
2 May 2017 Challenge Chrono II "Brancard"
29 March 2017 Shine "Etoile"
22 March 2017 Place Vendôme "Lumières"
17 March 2016 Don't miss the Baselworld edition! 17 March 2016 Monsieur ! 15 February 2016 "Signature de Chanel"
23 March 2015 "De Bethune is undoubtedly the biggest of the small brands"
19 March 2015 Dior VIII Grand Bal "Cancan"
18 March 2015 Video. 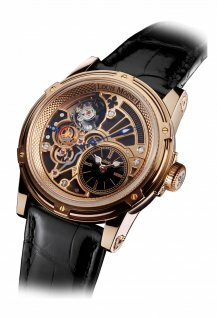 Tradition 7087 Minute Repeater, Tourbillon. 12 March 2015 Dior’s 2015 collections are vibrantly colourful! 29 March 2014 Baselworld 2014 : A really complicated World Cup! 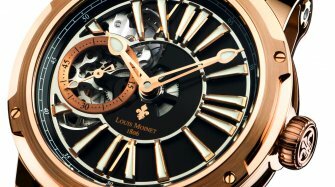 Combining black and rose gold for a contemporary look, the Ateliers Louis Moinet revisit one of their most emblematic timepieces, the 20-Second Tempograph. The compelling presence of the new Tempograph Black resides in the combination of black and rose gold. One absorbs the light while the other reflects it. One is intentionally modern, the other pays tribute to the noblest days of traditional fine watchmaking. Together, they produce a balanced timepiece that blends diverging styles. Enhancing the traditional spirit, the gilded hands complement a flange engraved with a Clou de Paris pattern. For the finishing contemporary touch, the seconds are shown at 9 o’clock, in the form of a mobile display divided into three sectors (grey, red, and black). Beneath this contrasting yet coherent assembly sits an all-black plate adorned with the skeletonised bridges of the in-house caliber, comprising 260 components. 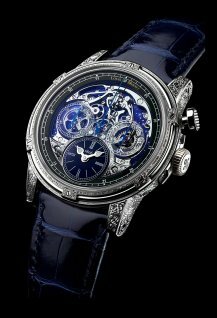 It’s been made all in one piece, with no additional module to house the complication. This integrated construction adds to the sense of technical coherence for the piece as a whole. At 8 o’clock, the subtle interplay of the cam and ruby-tipped rack is on display, together with a fully visible balance wheel, and shows an amazing spectacle. 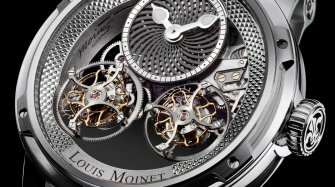 To wind the movement, the Tempograph uses “Energie Plus”, an automatic pawl winding system featuring a spring with a ‘crab claw’ design. The final part of this system is a miniature ceramic ball bearing, mounted on the dual-material rotor. The key advantage of “Energie Plus” is that it allows the piece to be wound up in both directions, with a minimum of excess travel. This optimizes each movement of the rotor, harnessing its energy to the maximum, and winding the caliber more effectively. 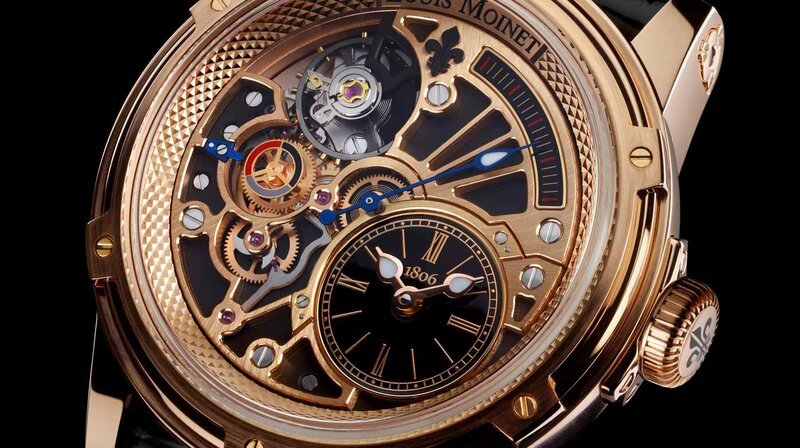 The new Tempograph sports an hour dial at four o’clock, featuring the rose gold hands with “dewdrop” tips that have become one of the aesthetic hallmarks of Ateliers Louis Moinet, sweeping over Roman numerals and a minute rail designed in the purest watchmaking tradition. 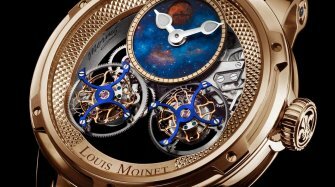 In the centre sits the retrograde large hand that has made the Tempograph famous. 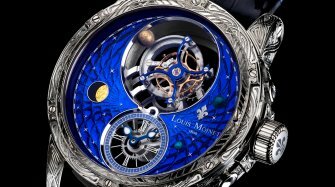 With a continuous twenty-second sweep, it brings the dial to life in a unique manner, a direct nod to the automatons from the Enlightenment era of watchmaking, when Louis Moinet himself was creating his finest timepieces and grandest clocks. 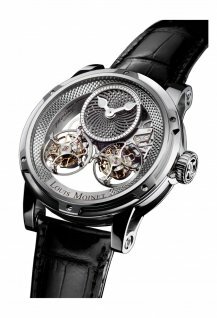 Ateliers Louis Moinet was born out of the passion of one man, and this is clearly to be seen in each of its creations. The Maison takes the concept of exclusivity to its height, producing only limited editions.